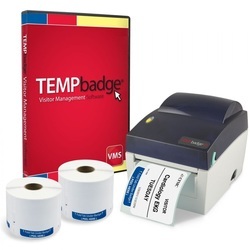 The new TEMPbadge VMS Visitor Management System is a great step up in security. Featuring our patented self-expiring badges, easy-to-use software, and a durable direct thermal printer, this system is like no other. Simple but incredibly effective, TEMPbadge VMS meets your visitor management needs professionally with little to no training required.